Guys! It’s just around the corner. Can you feel it? I can practically smell the pies now! I don’t know if you’re hosting or cooking this year, but typically it’s a LOT to handle. Today, I’ve got my guide to Thanksgiving. 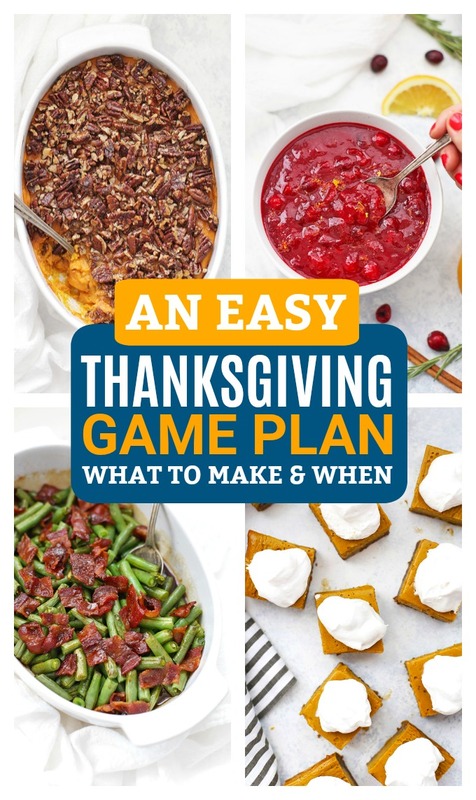 Think of it like a Thanksgiving game plan of what to cook when. 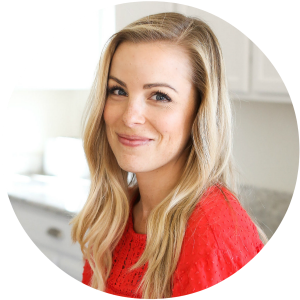 I’ve added tips for getting ahead, what you can prep early, and a whole lot of recipes to get you started. Happy Thanksgiving!!! Made ahead is your friend. Remember that everything you can do ahead of time means less you have to do on Thanksgiving Day. I recommend mixing up as many components, chopping as many veggies, and prepping whatever you can early. Outsource away from your oven. Consider those kitchen appliances. Your slow cooker, rice cooker, Instant Pot, or even a smoker outside. Anything you can do to free up oven space will be your friend. 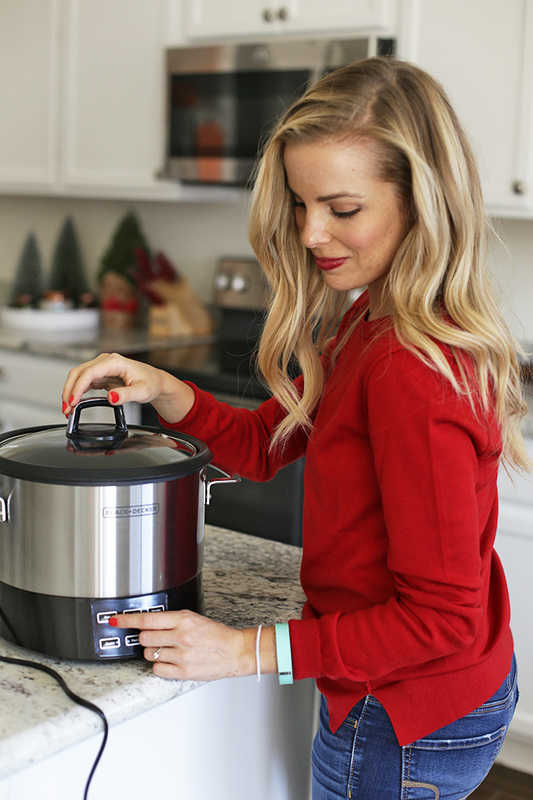 Try one of these 3 side dishes you can make in a rice cooker, try a recipes for slow cooker or Instant Pot mashed potatoes, or even smoke your turkey instead of roast it! Whatever you can “outsource” away from your oven will be helpful. Nail down your shopping list if you can. I have a friend who keeps a shopping list of the family recipes they use every year in a binder. She uses the same list every year since they make the same dishes. That way she doesn’t forget anything. Genius! I don’t recommend doing cream pies frozen as the texture is often disrupted too much upon thawing, though you CAN prep and bake your crusts if you like! Then all you need to do is make up the filling later. Start thawing your turkey if it’s frozen. It can take several days in the refrigerator to thaw and you WANT THAT TURKEY THAWED. Any still-frozen bits can mean undercooked turkey in some parts and overcooked turkey in others. No bueno. Give your turkey plenty of time to thaw. Also: Put that turkey (even though it’s bagged) on a plate or in a large pan. That way you won’t discover raw turkey juices have made a mess and dripped all over other things (like produce!) in your fridge through a tiny hole somewhere in the turkey bag. This is the day to do as much chopping and prep-work as possible, if you can. Whatever you can get done today means one less thing to do on Thanksgiving. A few of my favorite make-ahead ideas are below. Don’t feel like you need to do all of them. Just check off what you can. Brine your turkey. Whether you’re doing a dry-rub brine or a “wet” brine, get that party started the day before. More time = more flavor, but don’t put your turkey in a salty brine more than a day before Thanksgiving or it can start to get tough. Mix Up Your Sweet Potato Casserole Filling and Topping. You can make the mashed sweet potato portion and mix up your topping ingredients (store separately). On Thanksgiving day, all you have to do is transfer your potato mash to the baking dish and sprinkle on the topping. Done! Try my Paleo or Vegan Sweet Potato Casserole. It’s out of this world. If sweet potato casserole isn’t your jam, try these Chipotle Mashed Sweet Potatoes. They’re a really delicious option that re-heats like a dream! 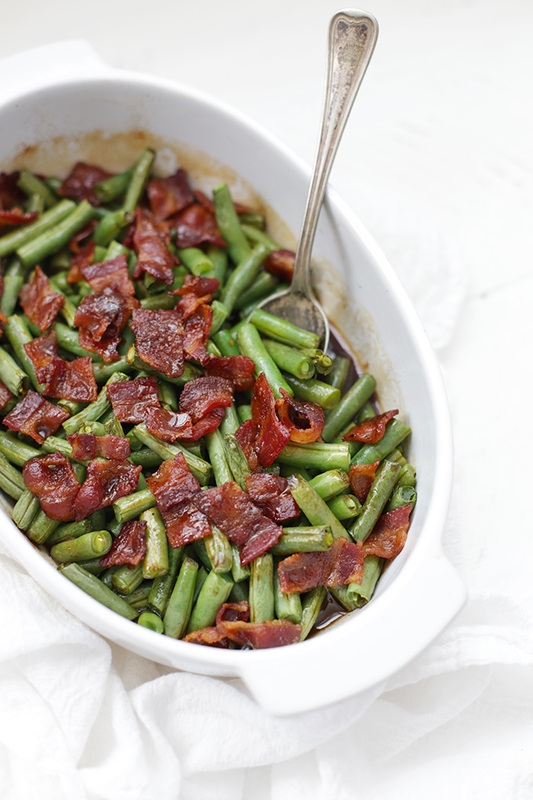 Smothered Green Beans or Green Bean Casserole Get Prepped! Cook your green beans, mix up any sauces or toppings and keep most things separate till tomorrow. 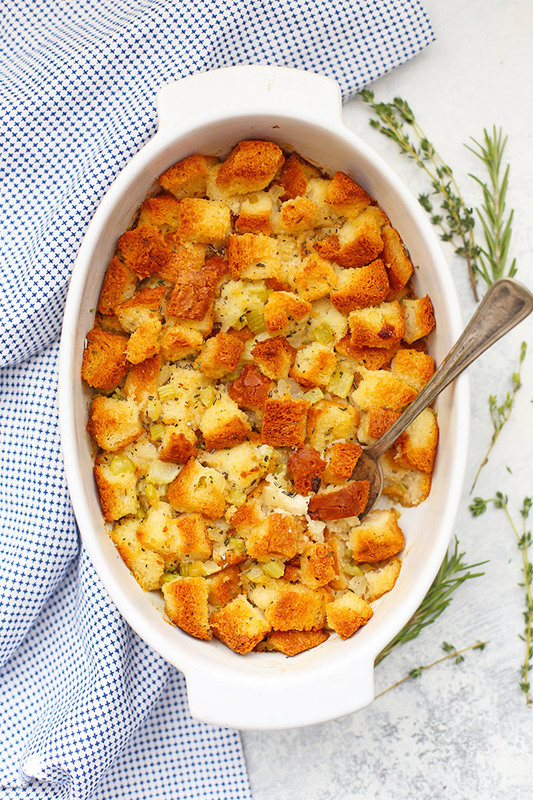 Dry Out Your Bread For Stuffing. If you’re doing homemade stuffing, this is the time to dry out your bread. It takes about 1 hour at 250 degrees to fully dry out the bread. Let it sit at room temperature overnight. Sauté your veggie mixture and store that in the refrigerator overnight. If you’re adding sausage, you can also brown and drain that today, too. Try this recipe for gluten free (or not!) homemade stuffing. The same method works with wheat-based breads, too! Cranberry Sauce This is another easy way to get ahead. 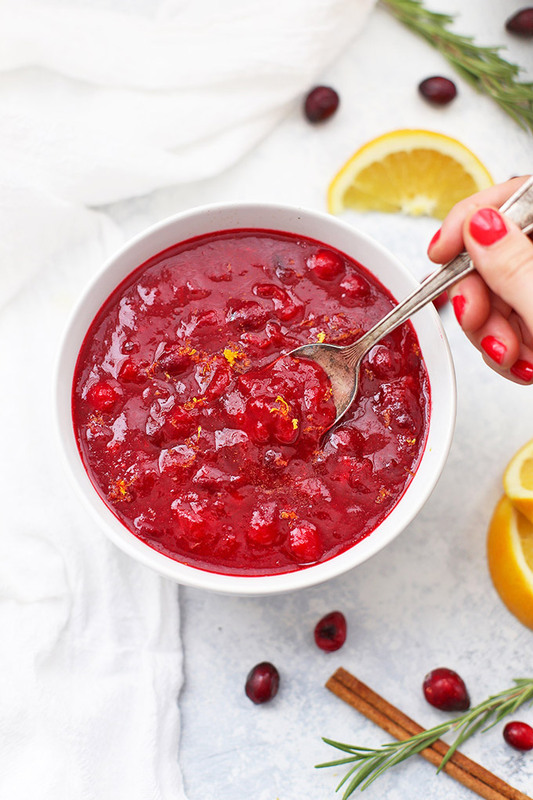 If you’re making cranberry sauce, you can get that done early (the flavor will actually get even more developed with time). Cold Salads. If you’re serving any kind of salads, you can prep them fully (or at least do any chopping of veggies, mixing up dressings, or crisping of bacon that might be needed). Consider baking your rolls, bread, or muffins. Stuff like this usually reheats beautifully. After pulling my turkey out of the oven on Thanksgiving day, the turkey needs a little time to rest before carving (to allow all the juices to redistribute). In those 10-15 minutes, I pop my rolls or corn muffins in the oven and let them warm back up. No one is ever the wiser! Get out the dishes. I did this last year and it was super helpful. Set out the gravy boat you only get out once a year, find the fancy spoon you use for the cranberry sauce, etc. I usually just pull out the baking dishes, serving bowls, and platters I’m going to need. That way I’m not scrambling when the food is ready. Turkey gets priority here. Also keep in mind that because your oven is likely to be crowded, things almost always take longer than they would otherwise to bake. Plan on adding an additional 15 minutes or so at least to any side dishes or casseroles. As always, keep a watchful eye and try not to open the oven door very much since it lets out so much heat. Get that turkey started. Turkey tends to take the longest time, so just go ahead and get that going first thing. Stuffing – You’ve got all the components ready! Just stir together your stuffing ingredients, mix in the broth and bake. Sweet Potato Casserole – You’re already prepped and ready! Just put it in the baking dish and you’re ready to go. Veggie Side Dishes – Many of these are stove-top friendly, like glazed carrots or mashed potatoes. Pace yourself and plan to get these started with about 30-60 minutes to go before the Turkey is done (unless they need oven time). Some things (like cooked carrots) can store in a slow cooker on the WARM setting, so you can get them done early, if you like. Set out the cranberry sauce, mix together the cold salads, etc. Once your turkey and any veggies, sides, or casseroles are out of the oven, you can reheat or warm any bread/rolls/muffins you are serving with dinner. Make (or warm up) your gravy while the turkey rests and the bread is warming. Keep your side dishes covered with foil if needed to keep them warm. While you’re eating dinner, you can bake or warm up your pies if you like. 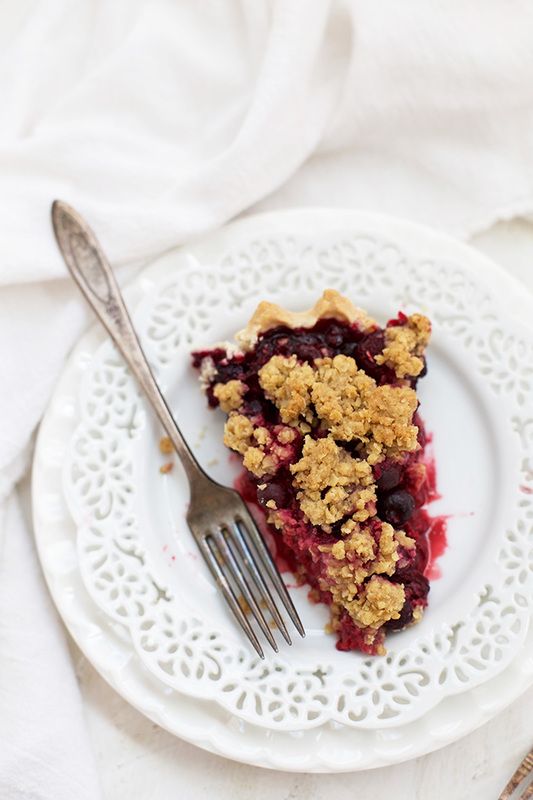 If you do pie later, then just sit back and enjoy your meal! Bless you and your meal-prep wisdom! I make your Apple Crumble Pie every year, usually doing it the night before then reheating it a tad during dinner. Is this one you think would be OK to freeze unbaked? If so, would you recommend putting the crumble topping on before freezing or once it comes out of the freezer? Yes! I absolutely think it’d be great to freeze unbaked. I’d put the crumble topping on and freeze the whole thing that way. You may want to put the unbaked pie on a plate or tray in the freeze for 20-30 minutes before covering it with foil/bagging it/wrapping it. Hi any recipes for slow cooker mashed potatoes? Mariam – I haven’t done one, but this one by the Kitchn has a lot of great reviews! 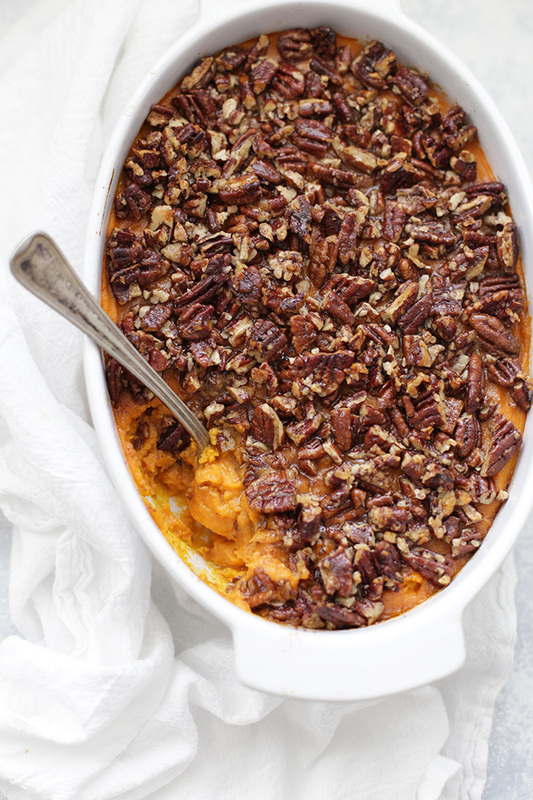 How do I find the sweet potato casserole recipe? Tasia – Did you scroll in the post at all? It’s right there in the middle. For convenience, here is again. Happy Thanksgiving!